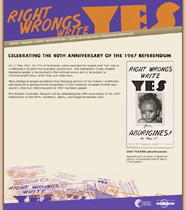 The Western Australian Museum was celebrating the 40th Anniversary of the 1967 Referendum which gave the Aboriginal people the same rights and freedoms as the rest of Australia. The Museum was celebrating the anniverary at the Perth, Albany, Geraldton and Kalgoorlie-Boulder sites. My role was to create the web version of the exhibition and put a DVD together. The DVD featured a clip of former Australian Prime Minister Gough Whitlam campaigning for Aboriginal rights at Forest Chase in Perth Western Australian in 1967. Videos from the DVD can be found on the website. Screenshot courtesy of the Western Australian Museum.